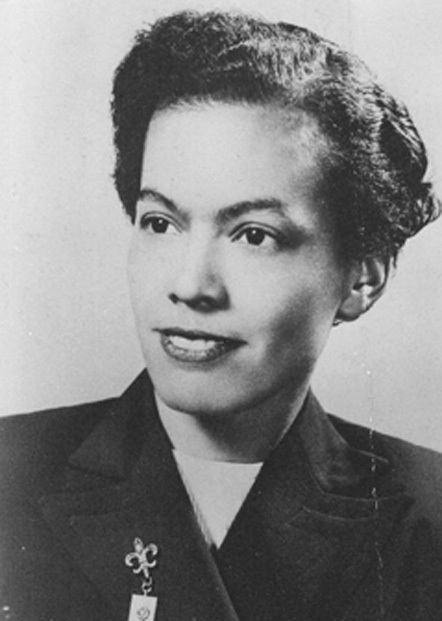 Pauli Murray was a civil rights and women’s rights activist, lawyer, educator, author and poet, and the first African-American woman to become an Episcopal priest. Born in Baltimore, Murray was raised in Durham by her aunt, Pauline Fitzgerald Dame, and her maternal grandparents. She graduated with distinction from Hillside High School and received an undergraduate degree from Hunter College in New York. In 1944 she graduated first in her class from Howard Law School, where she first encountered sexism. She received a masters of law from the University of California at Berkeley, and in 1965 she became the first African American to earned a doctorate in law from Yale. She was denied admission to the social work program at the University of North Carolina in 1938 because of her race, and to Harvard, because of her gender. Murray was arrested and jailed in March 1940 for refusing to sit at the back of a bus in Virginia and participated in lunch counter sit-ins in Washington during her time at Howard. In 1950 she published States’ Laws on Race and Color, which Thurgood Marshall called “the Bible for civil rights lawyers.” The NAACP used some of her arguments in arguing the 1954 Brown vs. Board of Education case that declared separate schools for blacks and whites unconstitutional. In 1956 Murray published Proud Shoes: The Story of an American Family, a biography of her grandparents and of her life as a child in Durham. In 1963 she became one of the first to criticize the sexism in the Civil Rights Movement. She taught at Brandeis University from 1968 to 1973 and was a founder of the National Organization for Women (NOW) in the early 1970s. In 1977 Murray performed her first service at the Chapel of the Cross in Chapel Hill, where her grandmother, a slave, had been baptized and had worshipped. In 2012 she was named a saint in the Episcopal Church. Murray was a brilliant, complex, driven woman, and a friend of many of the most prominent people of her day, including First Lady Eleanor Roosevelt. Murray declared that “One person plus one typewriter constitutes a movement” and spent her life proving the truth of it.